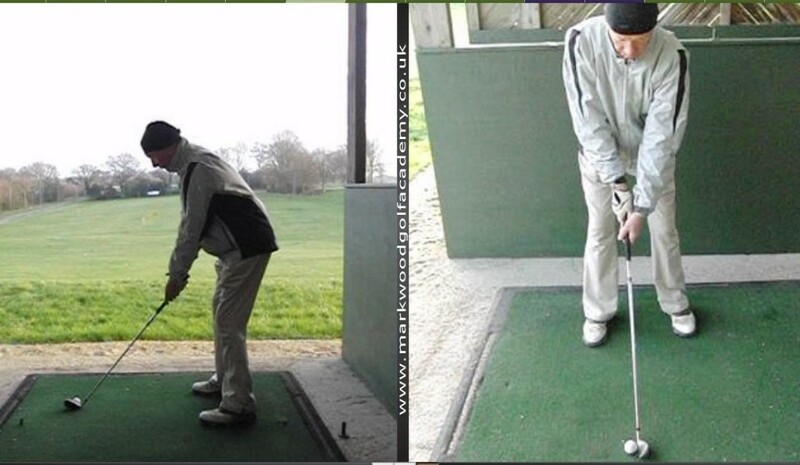 Today I had a client in for a lesson who had been struggling with his game for a couple of months. He had been putting off the lesson for a couple of reasons, one of which was the weather, I must admit it has not been to warm recently.. Within 5 minutes we had him hitting the ball so solid he said “I wish I had come to see you sooner. I have been struggling on for a few weeks now, trying to adjust things myself, but just could not put my finger on it”. Let’s look at the improvements that we made. 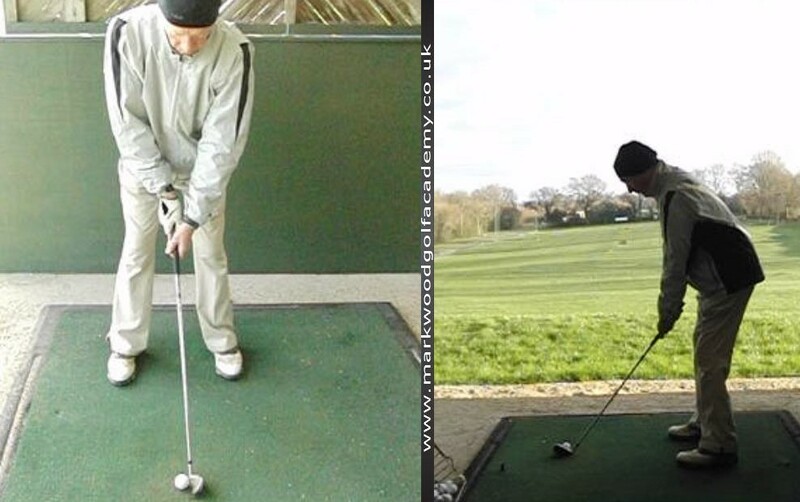 As we look at the photo above we can see that my client was over reaching for the golf ball (left photo). His hands were to far away from his legs and this was encouraging his weight to be to much on his toes at the address. The ball position was to far forward in his stance (right photo) causing him to hit the ground before the ball, heavy contact and very little distance. As he made his backswing the natural tendency was to lift his body up out of his posture. He did this to move his weight into the center’s of his feet to enable the body to turn in some kind of balance. With all this movement in the backswing the downswing resembled the same, with his body dropping down towards the ball in an aid to get back to his original set up position. The outcome of all of this was very weak strikes lacking distance. We worked on a posture drill to get him standing closer to the ball. This allowed for the arms to hang down freely from the shoulders and the weight was nicely balanced in the feet 50/50. We also moved the ball back a fraction in the stance so that the angle of attack would be a lot more consistent and this would improve the consistency in the strike. 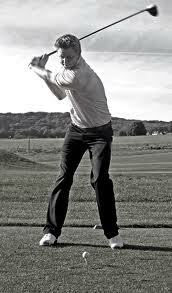 Now as he made his swing the body stayed in shape as he turned his body in the backswing and forward swing. There was no lifting and dropping of the body during the swing and the nett result – much better contact on the ball and full distance was regained in a matter of minutes. Had a client of mine pop in for a lesson today and we made some tremendous upgrades to her swing. The key thing we focused on was improving her body turn/pivot. As you can see in the above image (left picture) the swing before we made any changes. The hip turn was poor and as a result the swing had got long with a cupped left wrist which caused a very open clubface. The main focus was incredibly simple; we focused on letting the right leg straighten a little in the backswing (right picture above). This in turn naturally shortened the golf swing as the core was more engaged. This also made it easier to get the left wrist in a much flatter position at the top of the backswing. Having the left wrist set better in the backswing ensured a square clubface which made it so much easier through impact which resulted in soft baby draws!! The left picture above shows that the club was over plane in the downswing, this was a direct result all stemming from a poor body pivot which lead to a long swing with an open clubface. This makes it hard to control the accuracy of the golf shots and also lacks power and distance was being lost. 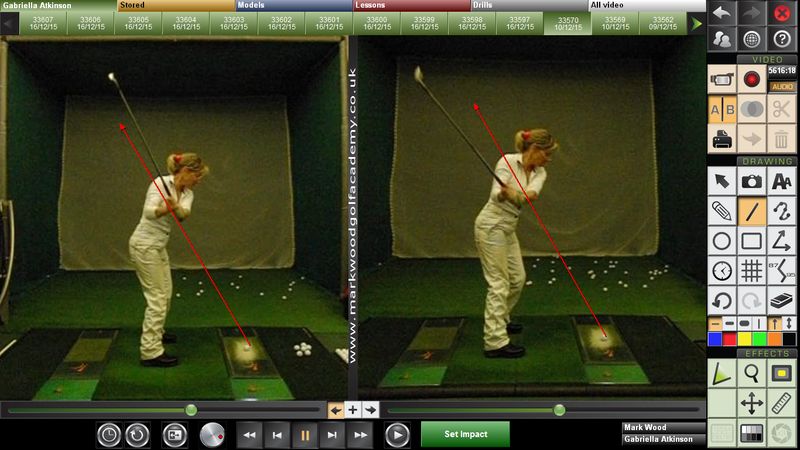 The right picture above shows the swing being on plane and in balance with a square clubface. Once again the swing thought was very simple, just let your right leg straighten a little in the backswing and hay presto we upgraded the left wrist position, clubface position and downswing plane which all lead to much greater accuracy and powerful iron shots. Very nice feedback from one of my clients….. Thanks for helping me with my game in 2014, I’ve improved a lot and really appreciate your coaching. I managed to win 3 trophies this year at The Nevill, the most by anyone in Centenary year of the club and handicap official reduced from 20 to 14. Below is a picture of me at the trophy presentation. I’m taking a few weeks break but will have a think about my goals for 2015 but keen to start another course of lessons to get my handicap even lower! Well done to all my clients on there recent successes. Well done to the following clients of MWGA on there Club Tournament results during October 2013. Danny Berta scored 40 points to win the Tams Stableford and Chris Willett finished 2nd with 37 points at Dale Hill. Geraldine Harland Fisher won the Ladies AGM Stableford over 9 holes on the Old Course at Dale Hill with a superb 21 points in testing conditions. Peter Crossfield won the Tams Medal at Dale Hill with a great nett score of 66. Steve Williamson finished joint first in the Top Dog Trophy with a nett 71 on a very wet and windy day on the Woosie course. In the Mens Stableford Chris Pugh came in with a great 43 points, Ron Stevens 2nd with 40 points and Kelly Jones 3rd with 38 points. Danny Berta won the 2nd Tams Stableford of the month at Dale Hill with a great 42 points. Well done to Ann Bassett on winning the Ladies Stableford at Dale Hill with 36 points and also to Rosie Hockey on finishing 2nd with 34 points. 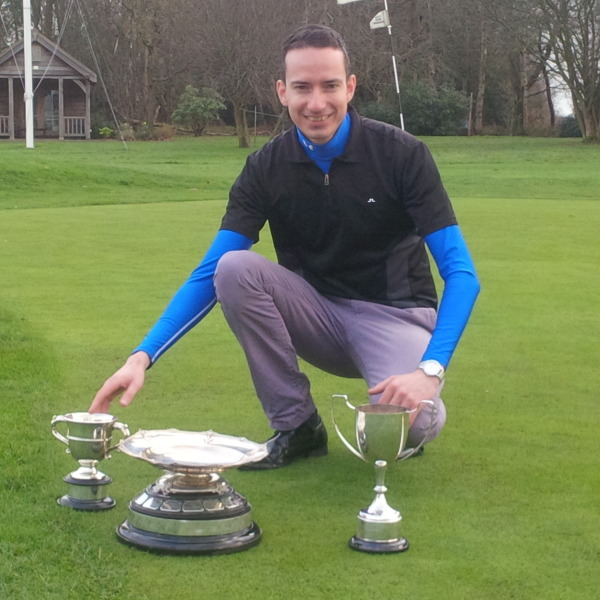 Mark Packard finished runner up in the Sussex Pairs Professional Matchplay Championship at Mid Sussex golf club. Mark also finished 2nd in the Sussex Pro’s Autumn meeting at Dale Hill with a score of +3. A big well done to Simon Wooder on winning the Silver Salver at the London Club with a good solid 38 points. Well done to Client Maria Tulley on winning the Sussex Pro’s Championship, Maria made history by being is the 1st lady champion in 101 years. Maria also shot a new ladies course record at Willingdon with a -8 (63) its been a great month. Well done to client Willie Clapperton on winning the Mens Club Championship at Eastbourne Golfing Park. One of Mark’s most promising upcoming clients Laird Shepherd (age 13) shot an impressive gross 72 nett 57 to win the Littlehampton junior open yesturday. This will bring Laird’s handicap down to 10. He will be playing tomorrow for Sussex against Essex and Kent at Holtye. Keep up the good form Laird and great lesson today on chipping and distance putting. Well done to Mark’s following clients with there recent wins and scores. Bill Shelley won the May Stableford with 39 points. 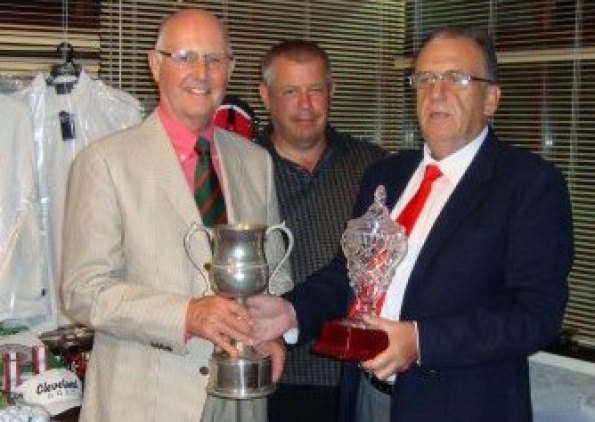 Phil Parkman and Brian Pennels both scored 40 points this week and Brian won on countback. Andrea Pilcher scored an impressive 39 points in the ladies this week. Well done to all and keep up with the great progress. Well done to Mark Wood Golf Academy client Andy Stevens on his recent Monthly Medal win with a nett 66. Andy had a lesson prior to his round and we worked on his swing plane and address position. This resulted in Andy winning the Monthly medal and reducing his handicap.